Plans to carve the figure of a white horse into a Kent hillside are about to be blocked by the European Union, according to the Green Party. 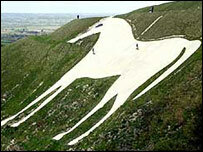 The white horse is due to be carved into Cheriton Hill, near Folkestone, next month as a Millennium Landmark. But the Green Party said on Thursday that one of its members had succeeded in having it stopped on environmental grounds. Klaus Armstrong-Braun, a councillor for Flintshire in Wales, took the case to the European Commission under the European Habitat Directive. A spokesman for the party said Mr Armstrong-Braun had now received a letter from the Commission, telling him Cheriton Hill had been awarded protected status which would make the project illegal. Shepway District Council said it was unable to confirm or deny the news, which had come as a complete surprise. A council spokesman said: "The Green Party press release forwarded to us by BBC Radio Kent is the only notice that we have had of this apparently recent ruling. "We do not know the status of this information and are now seeking further clarification." English Nature objected to the planned carving when it was first proposed because it said the hill was a Site of Special Scientific Interest (SSSI). After a public inquiry in April 2001, the then secretary of state Stephen Byers ruled the project could go ahead. The work, scheduled to start in April this year, was put back to June because the Gurkhas who are to be involved in carving the figure were needed to cover the firefighters' strike. Shepway District Council has just chosen the White Horse as its new corporate logo - and so faces potential embarrassment if the project is halted.